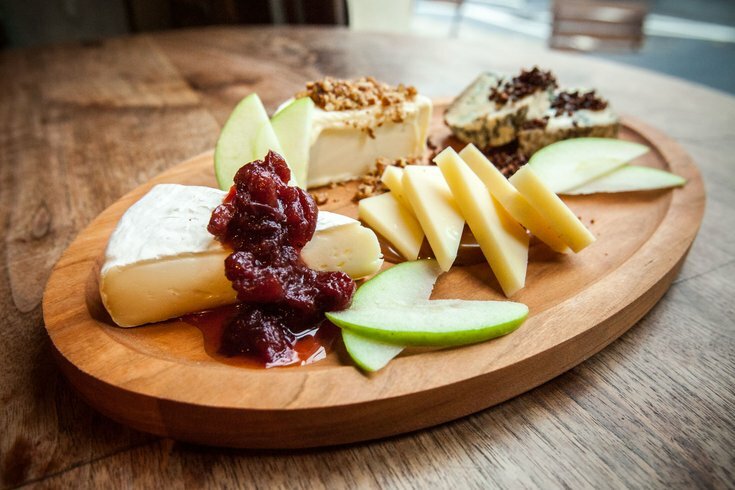 A cheese plate from Talula's Daily. Clockwise from left: Noble Road brie with a cranberry compote; Cremont double cream goat and cows milk from Vermont Creamery with a sweet pecan crumble; Birchrun Blue with candied cacao nibs and Tarentaise from Reading, Vermont with garlic miso butterscotch. In case you forgot, Valentine’s Day is tomorrow, and you might have some last-minute scrambling to do if you’re planning a last-minute date night. If you’re on top of things, maybe you’ve already booked a reservation at one of the restaurants Yelp has proclaimed among the 25 most romantic in the country – two of which are right here in Philly. Though the No. 1 spot was given to a restaurant all the way in Arizona, you won’t have to go quite so far for No. 11, Talula’s Garden located off of Washington Square Park. And just edged out of the Top 20, at No. 21, was Bistrot La Minette, a cozy French dining option on South Street. No doubt Talula’s scores romance cred for its on-point use of twinkly lights in the garden area, and it might do the trick for anyone who gets excited over locally sourced farm-to-table fare. In addition to accolades from Yelp reviewers, the restaurant has been named the most romantic in all of Pennsylvania by Food & Wine. Recently, a similar look at romantic restaurants sourced by OpenTable found Passyunk’s Victor Café to be the most coveted in the city, in part thanks to the live performances diners can expect during a night out there. Check out the Yelp’s full list at Travel + Leisure, and good luck out there this Valentine’s Day.